Hansa International Trading Corporation (HANSA) was founded in 1997 as a holding company, The highest levels in the Online Trading community to take our place as one of the major forces in today’s global markets. 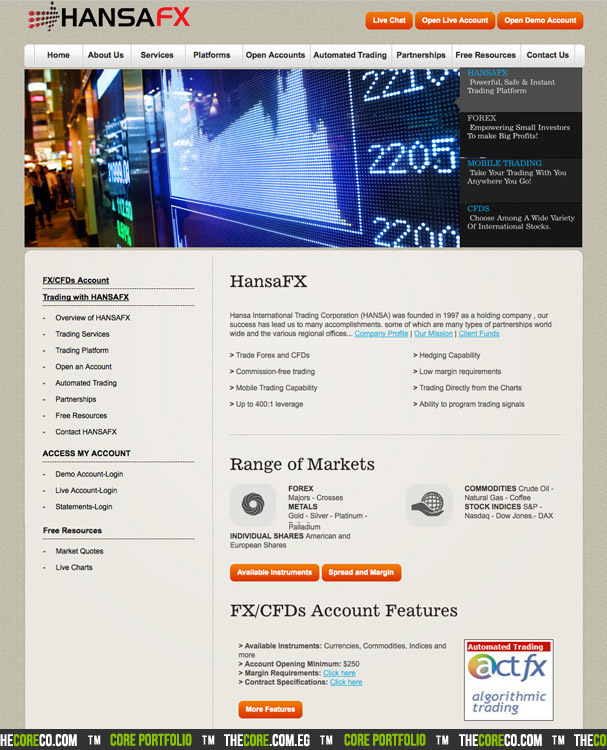 HANSAFX is one of the fast growing online market makers offering commission-free trading in Forex and CFDs. We offer superior internet trading software, fast and instant execution, and the lowest margin requirements. TheCore has a long partnership with Hansa International through the years, through our partnership we've accomplished a lot of projects between the two companies including this website, as well as other websites for Hansa entities like Hansa Hotels, and Hansa Aviation. Copyright © 2010 TheCore, LLC. All rights reserved.